Chopin Ballade No.1 - Who Is The Best Interpreter? Chopin’s extraordinary Ballade No.1 seems to inspire serious students of the piano, whether dedicated hobbyists or aspirant professionals, like no other single piano work. Its role at a pivotal moment in Roman Polanski’s 2002 film The Pianist has doubtless contributed to its celebrated status. More recently the sense of Zeitgeist around this masterpiece has been further enhanced by former Guardian editor Alan Rusbridger’s book in which he outlines his endeavours to learn the piece against all the odds (Play It again: An Amateur Against the Impossible). This article assesses the main recordings of the work available on YouTube, with the aim of helping you locate the most compelling performances. Given the range of richly rewarding interpretations on offer, from widely divergent artistic personalities, it’s clear that this piece of music truly inspires many of the world’s greatest pianists too. They are in good company: Chopin apparently told Schumann that this Ballade was his favourite among his own works. Having long occupied an exalted place amongst interpreters of this work, Pollini is well represented on YouTube, mainly in recordings taken from ‘live’ performances. If Pollini is at his best when he combines his commanding brilliance with a sense of space and a willingness to yield to the more lyrical impulses of the music, one of these recordings is pre-eminent. This is indeed a magisterial account: granitic, turbulent when the music demands, but also with an enchanting sense of reverie in the second subject, truly faithful to Chopin’s sotto voce marking. Throughout the work Pollini’s phrasing comes in long, organic paragraphs, contributing to an inexorable sense of the work’s overall architecture. Richter is also well-served on YouTube, mostly via recordings of various concerts from the 1960’s. Richter’s interpretation remains fairly consistent across these performances. His introduction is restrained rather than consciously arresting, and leads to a subdued main theme, cowed with sorrow. In the midst of such a weighty reading, his rather insouciant way with the second limb of the second subject in the recapitulation (from bar 180) is rather quirky – hardly the con forza stipulated by the composer. But in general Richter is fully responsive to the unfolding drama, and the denouement is suitably demonic. These less appealing characteristics are more pronounced on the various other Horowitz performances on YouTube. Indeed one version (posted by ‘boomzxz’) is nothing short of a travesty. The countless admirers of Arthur Rubinstein would cite the sheer individuality of his poetic sensibility as one of the crowning glories of his playing. His recording of the 1st Ballade, dating from 1959, certainly has those moments of insight, but some will feel that at times his rubato and tonal shading step across the border from revelatory to wilful. For example, the way he curtails the very first note of the piece or flattens out the triplet in bar 4 seem difficult to justify. Chopin was a perpetual revisor, and was on occasion even capable of sending substantially varied versions of the same work to his different publishers, so it would be ill-advised to argue for a frigid fidelity to the text in the performance of his music. However, he notated the rhythm of this Ballade’s introduction so precisely that it seems appropriate to adhere to his written intentions. Whatever are Rubinstein’s eccentricities, they pale into insignificance when set alongside Cortot’s performance. There is certainly something of the tortured artist here, and Cortot’s rhythmic liberties are at times so spasmodic that he could scarcely be seen as a prime contender. However, if one can disregard his distortions of Chopin’s text in, for example, the second subject, one can be drawn into a quasi-improvisatory dreamscape that is oddly intoxicating. Yet pianists from a bygone era such as Cortot don’t have a monopoly on extreme expressive freedom. The ‘live’ video of Lang Lang reminds us that not all today’s pianists are sanitized in comparison with their predecessors. Lang Lang allows himself more poetic (and sometimes textual) licence than most of his colleagues, past and present. There is fervour and panache in abundance; indeed the overall effect might be mesmerising to someone who had never heard the piece before. For those more familiar with the composer’s score and the general stylistic history of Chopin playing, some aspects of his interpretation are likely to be puzzling at best. For more convincing examples of rhythmic flexibility one might turn to Claudio Arrau. Of the many versions available on YouTube, recorded at various stages of his career, perhaps the most consistently fulfilling is one dating from 1953. Here, his way with the third phrase of the main theme (bars 12-14) or the apogee of the second subject (bars 79-80), to give just two examples, is very rubato indeed, but seems to fit perfectly in the context. Indeed, Arrau’s second theme in general is one of the most exquisitely contoured to be found anywhere. It is true that Arrau is less scintillating than many in the more bravura passages of the work, but this is a performance to treasure for the beauty and gravitas of its musical soul. In many ways Martha Agerich’s interpretation is the polar opposite of Arrau’s, in her characteristic emphasis on the volatile, tempestuous aspects of the work. Yet Agerich also finds room for a winningly tender second subject. Another strength of this performance is the dazzling clarity of her fingerwork in the central section, giving a wonderful sense of caprice. This Russian artist strikes a fine balance between respect for the score and apparent spontaneity. Individual phrases are lovingly sculpted and intelligently related to each other; this thoughtful approach shines, for example, in his very organic transition between the first and second subjects (from bar 36). There is much profundity in both main themes (although the slightly halting quality in the first theme is somewhat curious), and the central section pulsates with verve and playfulness. 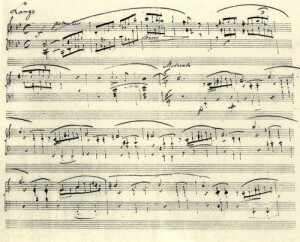 Unlike many others, Kissin observes Chopin’s con forza (bar 180) in the recapitulation of the second subject, giving this section a great sense of élan. The main body of the coda is not utterly relentless; instead he withdraws at the beginning of certain phrases, both tonally and rhythmically. Rather than detracting from the drama, this seems to magnify the ultimate annihilation. In a studio version captured on video, Michelangeli offers an aristocratic reading, understated and seemingly effortless. There’s not much red-blooded passion here, and the performance isn’t free of his ‘left hand before right’ mannerism, but there are substantial compensations, notably an irresistibly languid second subject. There are also various ‘live’ performances by Michelangeli (posted by ‘RabidCh’ and ‘incontrario motu’ among others) which are by no means carbon copies of each other, but in general he seems more emotionally involved and allows himself more expressive freedom (not always to the music’s advantage) than in the video recording. The main recording by Ashkenazy, taken from his Decca box set, has that emotionally searching quality that is one of the hallmarks of this artist. The main theme is mournfully ruminative, setting the tone for a performance full of pathos, perhaps sometimes at the expense of propulsion. Yet there is plenty of the requisite majesty and drama too, and Ashkenazy’s peerless tonal refinement makes for a deeply satisfying listening experience. There is an earlier ‘live’ performance by Ashkenazy, recorded in Moscow in 1963. This has much more of the impetuosity of youth (it’s over a minute shorter), the expression is in general more overt and the ferocity of the coda even more seismic. The recording quality is admirably clear but shows its age in an occasional hard edge to the piano sound. Perahia gives a powerful and insightful account. Some of the underlying chords in the first theme (especially in the recapitulation) are a little dry and obtrusive, but this is a minor quibble. This is a highly convincing performance, poised and intelligent, titanic when necessary but devoid of hyperbole. Other versions might be more captivating in individual aspects of the work, but few achieve Perahia’s cohesion, both in the relationships between individual phrases and the logic of the overarching structural framework. This masterful grasp of the musical narrative is perfectly illustrated, for example, in the transition (bars 188-194) leading to the final stricken intoning of the first theme. Gilels has an imposingly strident manner in this work, sometimes to good effect, especially in an exciting ‘live’ performance from Leningrad in 1963. There are moments of melting beauty, but in general the emotions are conveyed quite forcefully, and sometimes the sound is a little too stark for the context, for example towards the end of the first theme. There is a remarkable ‘live’ recording by the 14-year-old Umi Garrett. This is not just a question of gaping at a Wunderkind, and musing sagely if the child prodigy will be able to mature into a genuine artist. On the contrary, this is already a fully-fledged performance, full of artistic sensibility as well as marvellous dexterity, one with which to try a ‘blind test’ on your musical friends. Bolet is represented by a video recording, made late in his career, and indeed this performance has a distinct sense of a master looking back. Although many other pianists engulf us more remorselessly in the work’s turmoil, this performance is suffused with a haunting sadness that perhaps compels more deeply than some other more extrovert readings. Another performance of impeccable artistry comes from Andrei Gavrilov. From his suitably portentous introduction Gavrilov takes us on an absorbing journey through the work’s ever-changing landscapes. This is music-making of the utmost sincerity, and Gavrilov always directs his stupendous physical prowess to the service of the music. Towards the end of a titanic coda, his pronounced rubato and the sheer slowness of the final octave descent (perhaps too melodramatic for some listeners) crown the work with an epic fatalism. Unfortunately the rather muffled sound quality of the recording is not commensurate with the quality of the playing. The opening bars in Zimerman’s hands immediately set the tone for a performance of great grandeur and finesse. Every musical gesture is delivered with great conviction. His rubato is highly idiomatic and his phrasing wonderfully nuanced, although he is less ethereal than some in the more introspective episodes, especially the initial statement of the second subject. The central A major statement of the second theme is toweringly imperious. Overall, Zimerman’s interpretation has a severity that seems entirely appropriate, no more so than in the main body of the coda which is relentlessly pulverising rather than frenetic, leading with gripping inevitability to a bone-crushing final catastrophe. So who are the best interpreters of Chopin’s First Ballade? With such a range of outstanding performances to choose from it is genuinely difficult to select one definitive version. The most poignantly lyrical performances are not necessarily the most riveting in the more magmatic or mercurial aspects of the work. Ashkenazy, Gavrilov, Kissin, Pollini, Perahia and Zimerman are amongst the most enthralling communicators of Chopin’s kaleidoscope of emotions. But if forced to take just one performance to the proverbial desert island, it would be Krystian Zimerman. Interesting and enlightening post. Thank you.